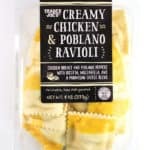 Now, I’ve tried and reviewed just about all of the fresh pasta in the refrigerated case. There are very few I don’t like. Some could be better. Some really stand out. This one here stands out. Yes, you have your standard fresh pasta. This is no different. It has two different stripes on it. One is a bright yellow on top, but on the bottom is a green stripe. Odds are it’s a subtle nod to the filling: the poblano pepper. Now, this ends up tasting like a bit of a mash up of flavors. While part of this is distinctly Italian, the poblano peppers add an enchilada flare to this item. After cooking this the quick 5 minutes and allowing it to cool (which brings the filling to a more enjoyable state), it reminded me of a different product: Trader Joe’s Chicken Enchiladas Verdes. There was something smokey, peppery, with a super mild heat to this. The chicken is chopped very small, so don’t expect huge chunks of chicken when you bite into this. Nope, it blends right into the filling. I didn’t mind it, but I know some would enjoy those big chunks of chicken. But with the added meat, I wasn’t left feeling hungry afterwards. Unless you are sharing, you might not even want meatballs to go with this one. Now, I know the next question: What sauce should I pair with this? While I enjoyed mine with olive oil, I think you’ll have to taste and see. I think this has the potential to be a split decision between traditional pasta sauces or even a bit of enchilada sauce with this one. For $3.69 these are reasonably priced. And while it said 2 servings, I might have enjoyed this as just a single serving. Would I buy this again? Yes. 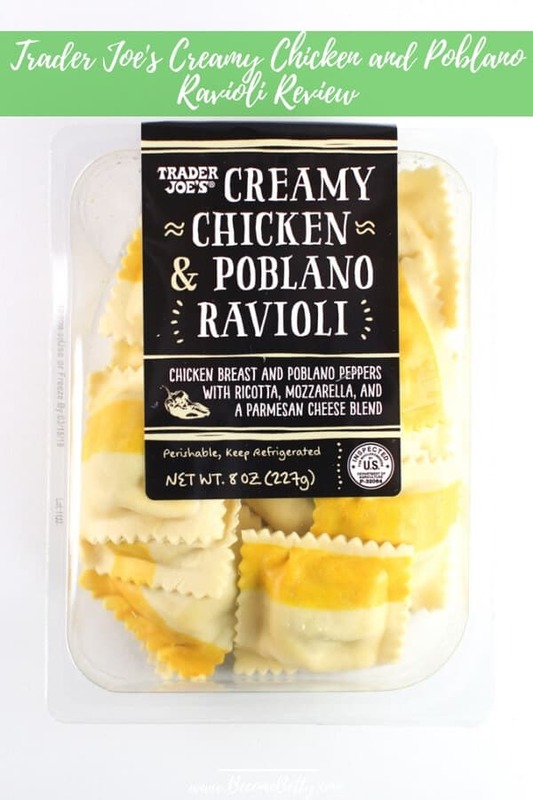 I would absolutely buy Trader Joe’s Creamy Chicken and Poblano Ravioli again. Maybe make a twist on the enchilada. Instead of tortillas use these and ladle some of the enchilada sauce. Some cheese on it. 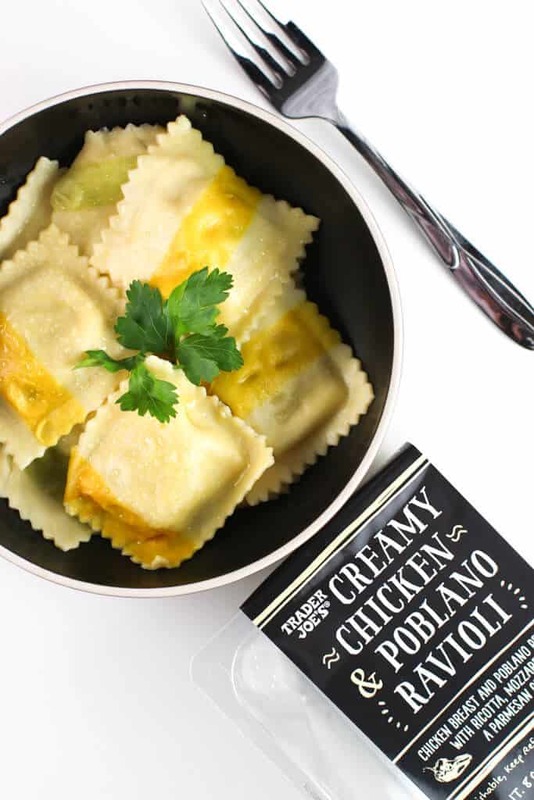 I miss the chicken pot pie ravioli which was the best thing created. Hey Alek! I remember those chicken pot pie ravioli too. They were so amazing. I miss them too. I remember them being seasonal, but they’ve been gone for too long at this point. Thanks as always for stopping by! Oh my gosh…these sound yummy. I can’t wait until I am not trapped by the snow storms to go to Trader Joe’s again. I can definitely see this with a sauce made out of concentrated chicken broth, a little white wine, olive oil and butter. Hey Dag! I hope all is well with you and the storms you’ve been getting this winter. We got a couple inches here in NY, but it should be gone by tomorrow. I’d love to hear what you think of these when your local stores are stocked again. 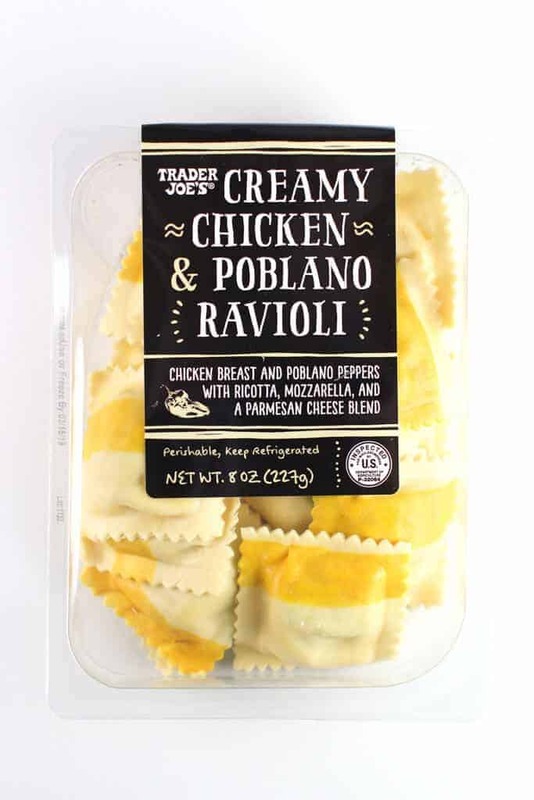 I finally got to Trader Joe’s tonight and bought several of the items you suggested to include this pasta. And I wanted to specifically let you know that the rose oil is back! I bought one tonight and will certainly be going back for more before they d/c it again! Hey Leah! Great suggestion for a sauce to pair it with. Thanks so much for sharing!